This time of year is full of indulgences and honestly, there is nothing wrong with indulging, especially when it’s done consciously, with joy, and in the company of those we love. I think whatever we choose to consume shouldn’t leave us feeling crummy though, unless those consequences are worth it and you know what you’re getting into (if you stew over your choice or feel guilty about it after the fact, it’s not worth it). Personally, I want a treat that doesn’t wreck me or send me into a tailspin and make me want all the sweet things. In my opinion, those consequences are not worth it. Fortunately, there are ways that I can have my cake and eat it too. 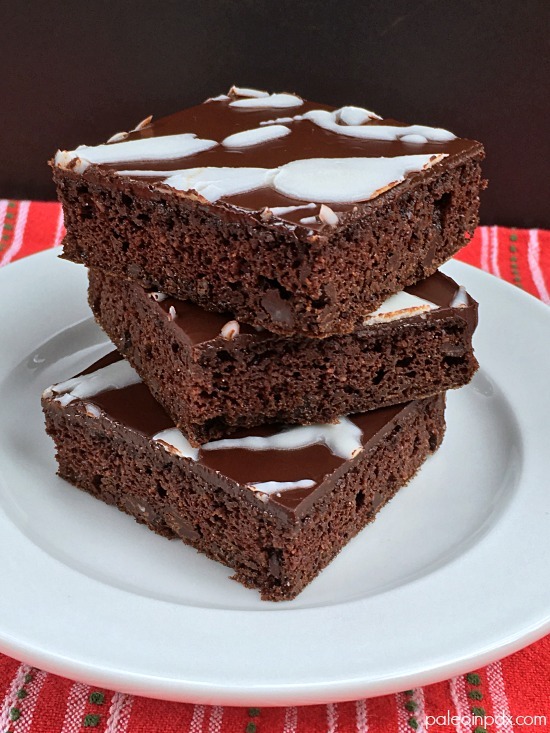 This holiday brownie recipe fits the bill. It’s made of high-quality ingredients, isn’t too sweet, and doesn’t leave negative after effects. It is, however, decadent, rich in chocolate flavor, and offers a festive dash of peppermint. After all, chocolate and mint are a classic holiday combo. These would be great without the mint though too, so if peppermint is not your thing, go ahead and omit it. Either way, it’s likely these brownies will not last long. We went through two batches quite quickly — just the two of us. It took me a couple batches to get it right, so we ended up with double and both were worth eating! Meanwhile, catch me making this recipe on KATU Afternoon Live later this afternoon, between 3-4pm PST. Watch the replay of my segment HERE. Line a 8×8 baking pan with parchment and set aside. Preheat oven to 350 degrees F.
In a large bowl, whisk together the wet ingredients. In a separate medium-size bowl, whisk together the dry ingredients, except for the chopped chocolate. Slowly whisk dry ingredients into wet. Whisk until smooth. Then, fold in the chopped dark chocolate with a spatula. Pour batter into lined baking pan and bake in preheated oven for 20-25 minutes or until a toothpick inserted in the center comes out clean. Allow brownies to cool in pan. For the ganache, melt 3 oz dark chocolate and 3 Tbsp butter in a double boiler on the stove, stirring occasionally. Alternatively, you can melt in the microwave, but be sure to do it on a lower power setting and keep a close eye. If your microwave has a melt feature, you can go that route as well. Once brownies are cool to the touch, pour the ganache on top and spread with a spatula in an even layer or gently shake pan to spread. Chill in the refrigerator until ganache is set. 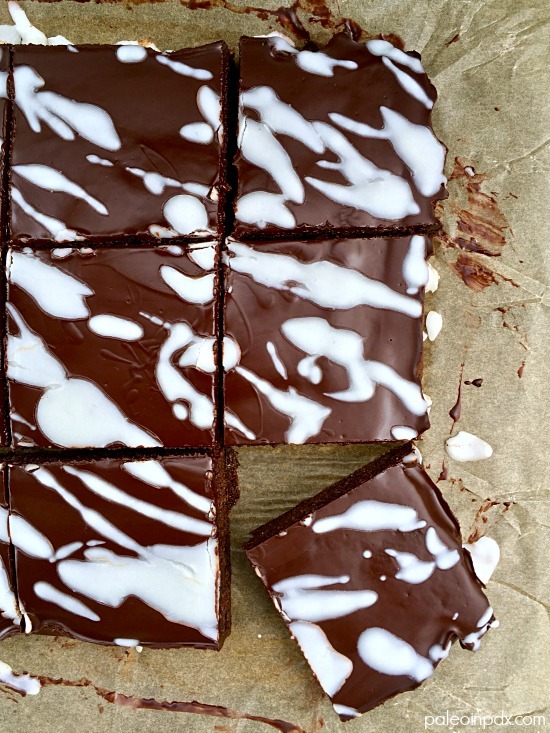 Then, drizzle with melted coconut butter and slice into desired-size squares.